According to both the scientists at the Royal Botanic Gardens, Kew, and one of my personal heroes - David Attenborough, the orchid genus that Charles Darwin coveted above all other is Catasetum. 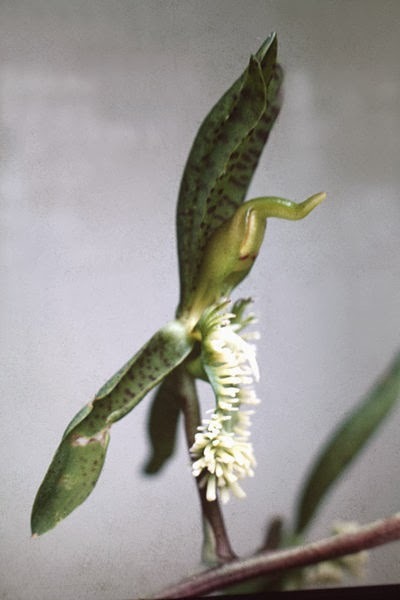 Unusual for plants within the orchid family, individuals are either male or female. The male produces a specific scent that attracts just once species of small, glossy, beautifully coloured bee. The bee lands on the lip of the orchid and thrusts its head into the hood of the flower. In doing so the bee touches a trigger which stamps a bundle of pollen grains (known as pollinia) onto the bees back. This is held firmly in place by a viscous glue. Understandably startled by its floral assault, rather than attempt to feed from second male Catasetum flower it chooses instead to search for nectar following a slightly different, but no less attractive scent. This would be the female Catasetum and to deceive the bee further the flower produced differs both in shape and colouration. The bee places its head inside the female flower, and the pollinia fits perfectly inside a tiny aperture like a key in a lock. Pollination has been achieved. The 'Sack-Shaped' Catasetum - Catasetum saccatum is a tropical South American species, and was actually discussed by Charles Darwin. 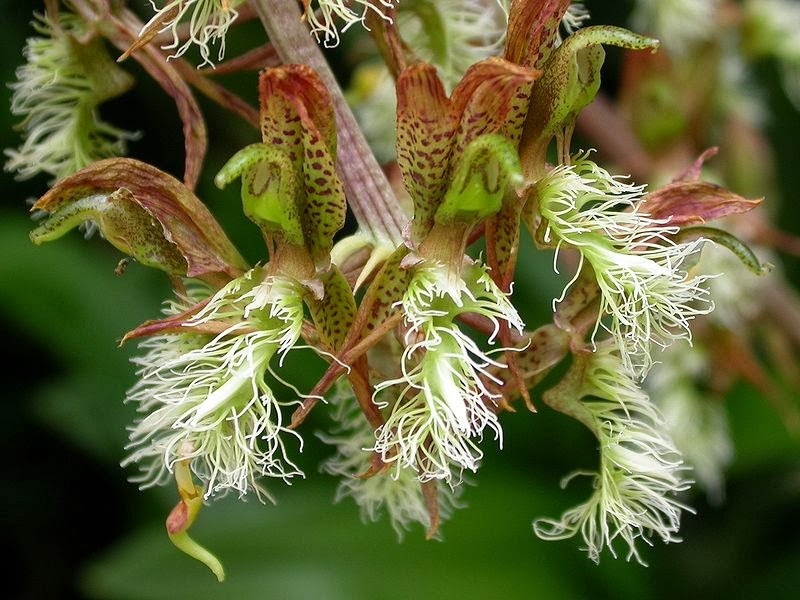 His description of the plant included its ability to launches its sticky pollen sacs with explosive force, when an insect touches the hair-like trigger mechanism. He was ridiculed for reporting this by the naturalist Thomas Huxley. However, history has proven that Darwin's observations were both true and accurate.